"Days of Wild" is a song by Prince and The New Power Generation. It was written by Prince in early 1994 after his name change to an unpronounceable symbol. The song is regarded as one of Prince's first legitimate successes at rapping and is both an ode to and criticism of gangsta rap. Strong language and cursing is used throughout the track, but it ultimately elevates women with lyrics such as "A woman everyday should be thanked, not disrespected, not raped or spanked". "Days of Wild" is pure funk, relying heavily on bass guitar as well as the organ and samplers to create an infectious groove. "Days of Wild" was premiered live in concert in February 1994 along with other new material to promote Prince's new on-stage persona, performing all new material. Shortly thereafter, the studio version of this song and others were played as a promotion on European radio stations and began circulating among collectors. "Days of Wild" became a crowd favorite at concerts, despite it never being officially released. The song was originally to be released on 1995's The Gold Experience but ended up being pulled for unknown reasons. Comments by Prince and associates suggest that he may have simply been dissatisfied with the studio version, which pales in comparison to live performances. A live performance of the song (an edited version of a performance from August 5th 1995) was eventually broadcast on a VH1 special segment of Prince videos in 1996. It was also played at Paisley Park on December 9th 1995 and this particular version was eventually released on the 1998 Crystal Ball 3-CD set. Sometime after this point, Prince's mentor and spiritual guide, Larry Graham influenced him to eliminate cursing from his music and change the lyrics of older songs to fit in with his new morality. 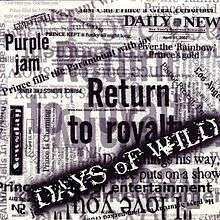 By 1998, Prince had revised the lyrics of "Days of Wild" in concert to eliminate the profanity. During the 2000 "Celebration" concert at the University of Minnesota, Prince even scolded the audience ("We don't do that no more!") when it began the "Play that motherfuckin' bass!" chant associated with concert performances of the song. A live performance from a 2002 concert in Montreal was released as a single on June 30 of the same year. Many have said that the cleaner lyrics dull the edge of the original track, of which the studio version still remains unreleased. The B-side to the single is a live version of "1+1+1 is 3", a track from The Rainbow Children that was performed on the same tour and included on the live box set, One Nite Alone... Live!. An edit of "Days of Wild" was also included on the single. "1+1+1 is 3" is a funk number and a metaphor for God, man and wife as a union. The single was only available for sale through Prince's online retail outlet and during concerts.